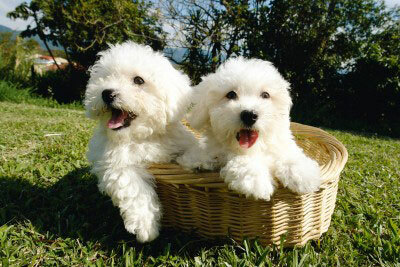 The "Maltese of the Month" is selected on the first day of each month and displayed on our Maltese dog breed home page for that entire month. To enter your dog, just fill in the form below. Good luck! Send us a picture of your Maltese or Maltese mix in a green outfit or surrounded by a green background to celebrate St. Patty's Day. The Wearing o' Riley's Green! My Maltese Izzy is a living doll and looks good in any color :) especially this green bow. She is now 5 months and weighs 2 and a half pounds. Maltese Sir "Royal" Highness Mommy's Finest! My little Maltese Vinnie has always loved to smell the flowers and grass. He is dressed for his first Easter in bunny ears. Here is my beautiful Maltese Le Mirage playing in a meadow.